Havan is the important Karmkand in Hindu. Special ritual stuffs offered in it. 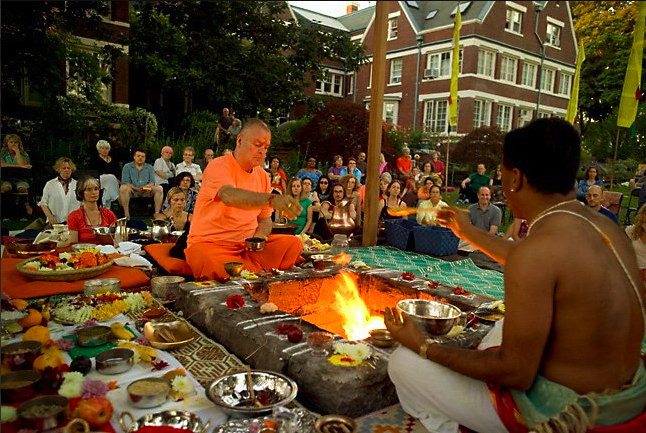 It is believed that whatever we offer in Havan it directly goes to god and satisfy them. Havan is necessary for completion of Pooja and Anusthan. Havan is done for purity of home, tout completion and desires. In ancient time, the length and broadness was similar of Havan Kund. Now they are same in length and broadness but deep from inside. If you want to give 50 Aahuti then it should be 1 feet and 3 inch. For 1000 aahuti it should be 1 feet 6 inch. If you are giving 1 Lakh aahuti then it should be 6 feet. Usually fragrance product and special stuff are used in Havan. Take Millet – Sorghum, rice and sesame in same amount. Keep pure ghee in it and after that start your Havan. Havan is done for different desires and stuffs. For different planets different types of wood are used such as for Sun - Madar wood, Moon - Palash wood, Mars – Khair wood, Mercury – Chidchida wood, Jupiter – Peeple wood, Venus – Gular wood, Saturn – Shami wood, Rahu – Durva wood and Ketu – Kush wood. Disease – Madar wood, Success in work – Plash wood, Children – Peeple wood, Sin – Shami wood, Pitrudosh – Peeple wood can be used. Use black sesame and Millet – Sorghum in same amount. Chant “Om Idm Pitray Idm N Mamah” for 108 times. At the end keep food on leaf plate and offer it to the fire. Extra Remedy: Mixed rosewater in corn flour. Apply it on your face and wash it after 5 minutes. The glow increase.